Enjoy our daily scuba diving trips, diving courses, intro dives, snorkeling and diving safaris in Bali. Our german diving school in Bali offers many possibilities for diving in Bali. In PADI diving courses our certified diving instructors will train you from basic education to professional divemaster. The training courses are being held in German or English, just as you like. Explore the most beautiful places in Bali; with your diving equipment always at hand. You can find us in Legian (Kuta), Seminyak (Denpasar) and in East Bali, Padang Bai, Manggis. We can pick you up at Nusa Dua and Tanjung Benoa, Jimberan, Sanur etc. See the map below. Dive into the breathtaking beautiful underwater world in Bali! Our professional dive guides show you unique dive sites. Experience an unforgettable holiday of the special kind with us. Gain the most with our dive packages that are worth their money! Bring new adventures into your life! Profit from our well-priced dive courses. Our highly qualified dive trainers get you into the water, on german and english. The internationally accepted PADI Dive Training Program prepares you perfectly for your adventures underwater. Service from a single source. We take care of everything, from flight to accomodation: we have the best offer for every need in diving in Bali. According to your wishes we show the most beautiful attractions in Bali. In our safari bus we move you and all equipment to the best dive site in Bali. This way you see not only the underwater world and best dive sites but also land and people! Discover the most fascinating sites in Bali with us. We show you unforgettable beautiful places far away from the mass tourism. Get to know land and people on a very special way. Benefit from our individual offers with best value for money for diving in Bali. Just write us a short message! 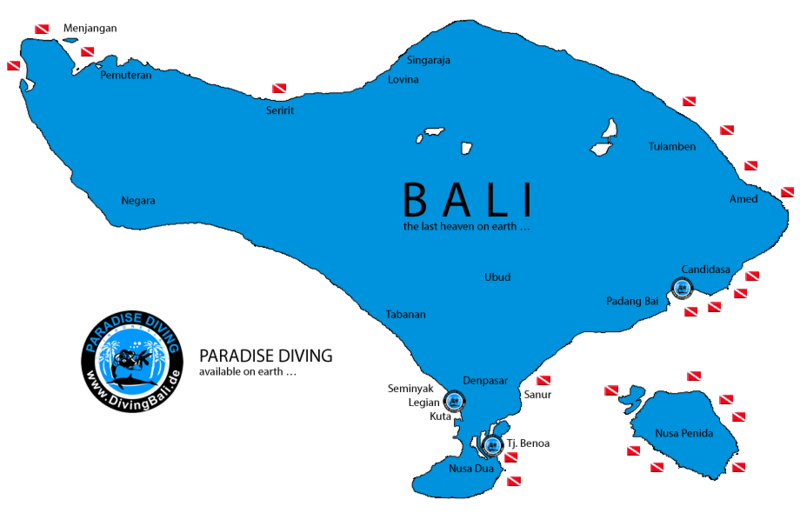 Diving in Bali ofers you world-class dive sites! Best starting point is east Bali. Bali is the island of the gods and smile - always worth a journey! Since many years our happy customers confirm our service. Some of them we can welcome every year as guest and friends. See the feedback from our guests and see for yourself. Of course we are always hapy about new feedback. If you enjoyed your time with us, please share your experience with us and other divers. Also on other rating portals we receive positive ratings from our guests. Our german diving school was founded in 2002 and we are still specialized on german divers. Diving in Bali, only the best diving sites! Pick-up from every hotel in South Bali. we are happy to present our new website to you. Right with opening our new Dive Base our new website goes online!